The saga of an Iranian gold trader has driven a wedge between Turkey and its allies. To understand Turkey today, you have to get into the mindset of Turkey’s ruling Justice of Development Party (AKP). No news bulletin can convey the sense of siege - the feeling that the entire world is collaborating to destroy Turkey and its leadership - that emanates from the ruling party these days. What is happening in Turkey? Where is this anti-western paranoia coming from? Is Russia wooing Turkey into its orbit? Has Ankara’s strained ties with Europe and the US finally pushed the country over the edge and into the wilderness? While the story of Turkey’s tensions with the West has been ongoing for years, and accelerated after the coup attempt last summer, much of the current meltdown has to do with one man, Reza Zarrab. His appearance in a Manhattan courtroom next week holds the key to Turkey’s short-term economic prospects – and possibly also its long-term geopolitical orientation. The stakes are high and Europeans cannot seem to grasp that for this brief moment in history, this trial is more important than any issue that surfaces in EU’s relations with Ankara. Zarrab is an Iranian gold-trader who married a Turkish pop-star in 2010 and rapidly climbed his way up Turkey’s power ladder. With several yachts, flashy homes and a fondness for celebrity status, Zarrab’s generosity as a Great Gatsby on the Bosporus bought him important friends. Nonetheless, in December 2013 he found himself at the center of a massive corruption investigation in Turkey involving illegal gold transfers and fake exports that had siphoned billions of dollars to Iran, circumventing international sanctions. Several sitting ministers were accused of accepting bribes from Zarrab, and the scheme allegedly centered around the state-owned Halkbank. The Turkish government saw the investigation as a Gülen-linked attempt to bring down the Erdogan government, and swiftly buried the case and arrested those who brought up the charges. But unbeknown to Ankara, an FBI inquiry was also quietly underway, and Zarrab was arrested in March 2016 when he landed in Miami to visit Disneyland with his family. Ever since, Zarrab’s predicament has been a top priority for Ankara in its relationship with Washington. Erdogan has reportedly complained about the case to President Donald Trump on several occasions, and publicly described it as “a clear plot against Turkey” – instigated, of course, by Gülenists. Ankara claims that Gülen-linked police and prosecutors who carried out the 2013 investigation in Turkey managed to pass on their evidence to the FBI. But the real worry is that the trial could highlight the role of senior AKP figures, even Erdogan himself, in facilitating Zarrab’s scheme. Meanwhile all indications are that Zarrab is taking a plea bargain, and might appear as a government witness, as opposed to a defendant, at the November 27 hearing, with possibly damaging revelations about state-owned Halkbank and senior officials in the Turkish government Ankara’s fear is that a damning verdict will result in the US Treasury slapping Halkbank and several other Turkish banks with hefty fines, rumored to be in the billions of dollars, triggering an earthquake in Turkey’s fragile financial markets. It was possibly a big mistake for Erdogan and the Turkish government to defend Zarrab so publicly. Instead of burying the 2013 investigation entirely, Ankara should at least have allowed a trial on corruption allegations. After all, Turkey could have done what Iran did – find a scapegoat, start domestic proceedings about corruption, and wash its hands of the scheme. But it’s too late for that now. 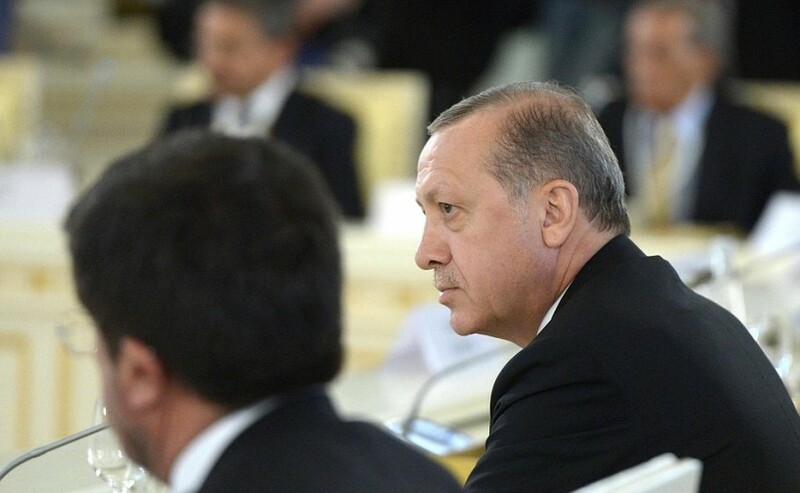 All that Ankara can do – and is doing – is try to delegitimize the case, at least in the eyes of the Turkish public, as a foreign plot against Erdogan – hence the rhetoric about Western efforts to topple the regime. But as the final court hearing nears, Reza Zarrab is all that Turks are talking about – on the air, in cafes, social media, or over family dinners. A direct result of that anxiety is reflected in the value of the Turkish lira, which has now depreciated to almost 4 lira per dollar, a sharp decline from roughly 3 Turkish lira to the dollar in early 2016. Internally, the Turkish government is deliberating what to do – whether to quietly accept the verdict while continuing the US-bashing for domestic audience, or defy the court decision and refuse to pay the penalties levied against Turkish banks. None of this is good for the Turkish government or for Erdogan himself – who needs a resilient financial system and enough funds to support Turkey’s massive social security budget, infrastructure projects, and defence spending in the run up to the 2019 presidential election. He already seems to have started campaigning, two years ahead of the ballot, by firing mayors and party officials in cities where AKP is faring poorly, and appearing at a public opening nearly every day— with his speech peppered with anger at his western allies and broadcast live on all Turkish news networks. With the Zarrab case hanging over his head, all Erdogan can do is shore up his domestic support and make sure that everyone in Turkey believes that the West is out to get him. This might cushion the domestic impact of the verdict, but it will not improve Turkey’s precarious economic situation - or its deepening problems with allies.